'Transparent' star Kathryn Hahn reveals to Larry the unique on-set exercise Emmy-winning director Jill Soloway uses to make all levels of the Amazon show's cast and crew feel welcomed and comfortable. Larry King: What makes Jill Soloway special? Kathryn Hahn: I mean, there's so many things. I feel like she's like, you know I think there is, I think it was Jack Johnson- was it Jack Johnson? There was some musician I remember that wrote a song that says "I'm gonna live the life I'm singing about in my song." I feel like she's like, she's doing that. You know, she just, she really, um, I just, I just feel that her, she's an incredibly authentic person. That is, just wants to tell stories and change people through those stories. LarryKing: What does she, what does she do with the box? Everybody has to stand up, what is that? Larry King: And the purpose is? 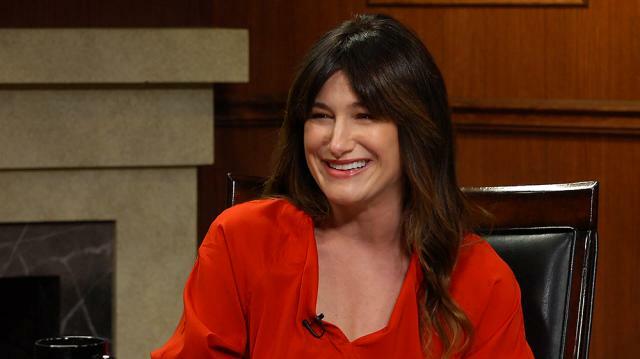 Kathryn Hahn: The purpose is I think like, to, as like, it just creates a democracy. Like it just, it just, the, like the old hierarchy of just like director, cast, crew, is just like--you know? It's like, well if we're going to be emotionally naked we might as well all be emotionally naked.